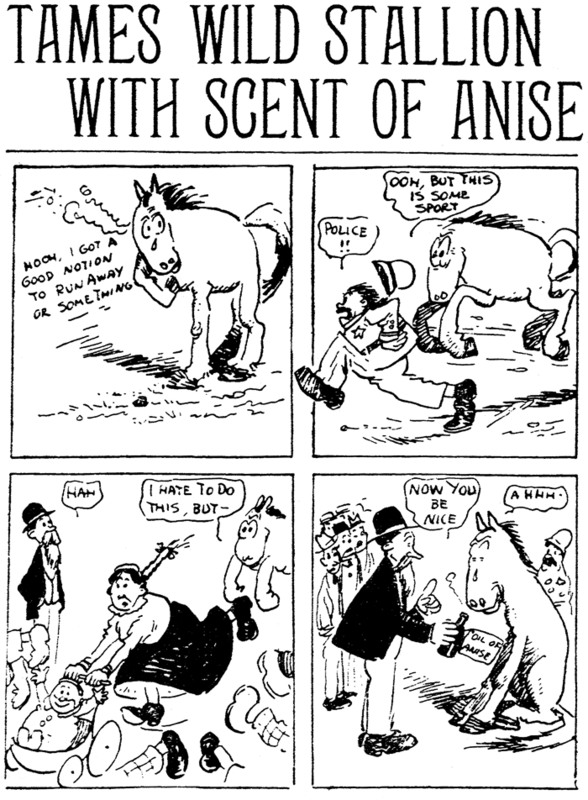 February 4 1909 -- Herriman graphically documents a story about a horse that got loose and went on a rampage in Santa Ana. The scent of anise, somehow gotten under the angry beast's nose, calmed him right down. 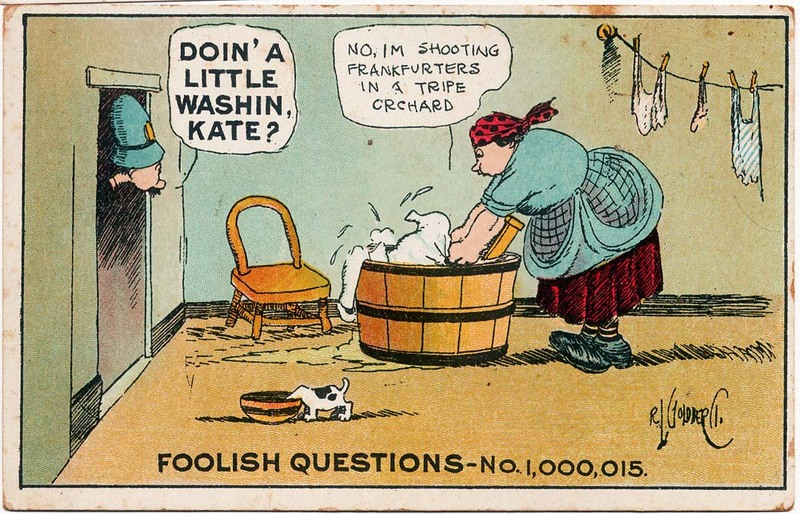 My absolute favorite Rube Goldberg foolish question memorialized on a postcard. What an inspired lunatic he was. If I was to have a tombstone (which I won't), I think I'd like it to say "No I'm not dead you sap, I'm shooting frankfurters in a tripe orchard". On the reverse is a small logo showing a B and S intertwined within a circle. It also says it is Series 213, and "Published in Book Form by Small, Maynard, & Co., Boston", a reference to Goldberg's first appearance in book form, published in 1909. This card was postally used, and the faint cancellation says 1910 I think. Muscular development was favored by a farther expansion of the paternal business enterprises. A mattress factory, a dyeing plant, a hauling and trucking business, and a traffic in metals jointly developed a miniature industrial center on Alazan Creek. Wooden shacks housed a score of Mexican workmen and some of their families. Among the artisans was Eusebio Barrera. Twenty-five, unmarried, with the lithe muscles of a mountain lion, he shuttled between lively humor and burning zealotry. A warm friendship sparked at our first meeting. Immediately, he took charge of my physical training. We began with wrestling, running and the moving back and forth of crated scrap-iron. Eusebio carved a large machete out of a discarded block of mahogany. It would be excellent to develop the sinews, he ex­plained. It must be used on the sorghum cane that choked a three-acre field beyond the corral. Three times more exertion would be required than if I used a scythe or a sickle. And as I hacked at the cane, I could think each slash was a stroke against the forces of injustice. Eusebio was sure there burned in me the same rebel spirit that lighted his own fiery temperament. He would teach me how to use a steel machete in battle. Then we could be comrades in arms when the great day came to liberate his beloved Mexico from the tyrant, Diaz. The prospect of a marching army of liberation meant more than Eusebio understood. Wouldn’t that be a short-cut to the job of a full-fledged newspaperman? Of course, Eusebio mustn’t know that while he dreamed of fighting I was bent on writing. I would start out as his comrade because that was the only way to reach the scene of action. Then, amid the crash of arms, when the battle raged fiercest, a brand-new war correspondent would come into his own. And Eusebio would be proud of his contri­bution to journalism. There could be no preparatory work too onerous for the achievement of such a glorious outcome. But there were annoyingly commonplace impediments. Vulgarizing compulsion into servile chores was depressing. A schoolroom incident snapped the chain of ignoble tedium. It came through a momentary petulance of the teacher, Miss Crider. Unaware of my extensive literary experience, she ques­tioned the authorship of a composition. It was during my turn to read aloud an essay on a subject that had been assigned to the whole class. The injustice and the manner of the reprimand were stunning. There was a retort, not in words but in demeanor. My feet scraped the floor as I sat down. The gesture nettled Miss Crider. She wrote a complaint to the principal, suggesting that I be punished for the offense of which she had accused me and for a show of insubordination. The note was addressed to a functionary who reveled in disciplinary activities. Prof. Emil Schoch, not yet in his thirties, had been brought from the little town of Castroville in Medina County to preside over the San Antonio High School. He exhaled appreciation of the honor and of the outstanding qualities that had earned it over the heads of all the instructors in the then leading city of Texas. Six feet two, with a luxuriant blond beard and steel-blue eyes, this Prussian martinet presented an impressive figure in the classroom that afternoon. And to me came the uncomfortable distinction of sole responsibility for his presence. The principal was in high dudgeon. At the acme of pious wrath, Professor Schoch announced that he would ask my father for permission to administer corporal punishment. That after­noon the principal intrusted to me for delivery to my parent a formal note transmitting the request. It was a message from one disciplinarian to another. The next morning I handed to Professor Schoch the written parental as­sent. He instructed me to remain after the dismissal of my class in the afternoon. Miss Crider sat at her desk while I awaited the principal. It was an awkward interlude. She was obviously unhappy. Several of the pupils had meanwhile acquainted her with my work as editor of The Amateur. They were sure my composition had not been cribbed. Schoch used a full-sized horsewhip. He plied it with lusty vigor. For this ordeal, I had planned an exhibition of stoicism during which I would gaze accusingly at Miss Crider. The vim of Schoch’s technique interfered somewhat with that program. The simulation of stolidity did not match the standard I had set. But I did eye Miss Crider. She wept copiously. Fourteen years later, Prof. Emil Schoch called on me as city editor of the Chicago American. 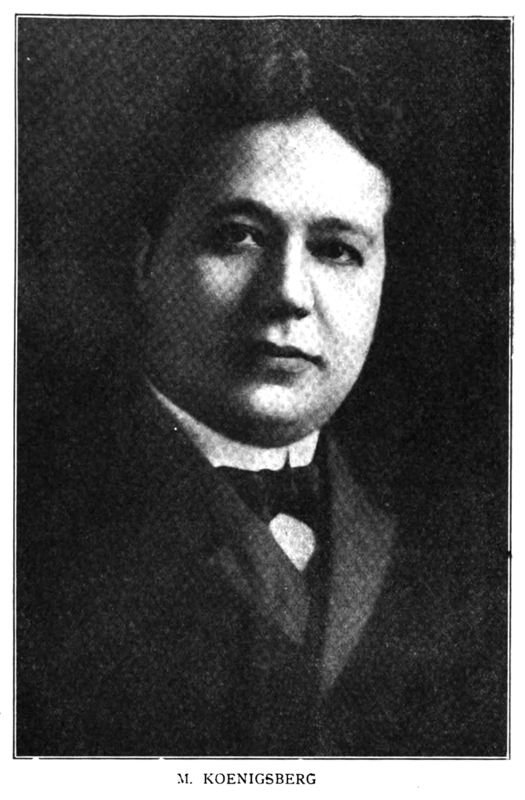 He had moved to Chicago and was principal of a west side public school. He wanted ad­vancement. He felt that as city editor of a leading newspaper I might apply some pressure on the school board in his behalf. I didn’t tell him that I believed such a procedure would be un­ethical. He wouldn’t have understood. The last lash of Schoch’s horsewhip stung into vital energy the latent spirit of a rebel. Until then, the world had required the services of journalism for the upbuilding of truth and the spread of wisdom; but now it was clear that Herculean tasks were at hand to overcome the agencies of evil. How could civilization progress, how could truth move forward if the law continued to sanction the infliction of injustice and abasement at the end of a horsewhip? It was a swift dash from Emil Schoch to Eusebio Barrera. Hereafter the comradeship with Eusebio would have much richer portent. He was a rebel not only against the oppressor of Mexico, but against tyranny of every sort everywhere. We must get into action at once. No sustained effort was made to persuade a resumption of school attendance. The first suggestion evoked such a vehement rebuff that my parents agreed to temporize. There was no truant law to invoke. But idleness was unthinkable in the paternal view. Reading without expert direction was little better. In a few days grave discussions of a career were initiated. There was no thought of mercantile activity. My unfitness for business was apodictic. There were too many unexplainable twists of my mind, in the paternal judgment, to permit the possibility of success in trade. But my father did believe I should take up law or medi­cine. Indeed, my irrepressible eagerness to argue, which he so continually chided, might well be a covert blessing. Perhaps it held the key to forensic triumphs. These family conferences offered rich opportunity for the verbal exposition of an editor’s views. No calling was sufficiently attractive, expounded the unregenerate and unabashed champion of journalism, unless the work touched upon the interests of the entire community. Medicine dealt only with that part of the population that was unhealthy. If there were no evils of the flesh there would be no need for physicians. The practice of the law applied chiefly to those who violated it or sought to violate it. If there were no evils of the mind there would be no actual need for lawyers. I was interested only in such a vocation as would make my service valuable to both the healthy and the unhealthy, to those who invoked the law and to those who didn’t—to everybody, men and women, no matter what their religion, politics, business, pur­suits or engagements might be. My father threw up his hands. A herd of goats butted a climax into this debate. The flock had been added to the string of variegated Koenigsberg under­takings. A herder was needed. Of course, the job was assigned to me. It was a bitter pill—a sheer abasement. I didn’t like goats. Their mere proximity was disgusting. How could a goatherd ever gain the high plane of idealism along which must walk the soul of the true journalist ? An answer came at sundown. The equipment for the day’s tour of duty had consisted of some sandwiches, a canteen and a copy of Bulwer-Lytton’s Zanoni. The goats were completely engrossed in their own affairs. They were disposed not to bother me and I reciprocated the disposition. In mid-afternoon I found an especially convenient coign for reading. The book absorbed every sense and thought. The night that often pounces out of a gleaming Texas sunshine jerked me back to reality. Even if the goats were at hand, they would be indiscernible in the inky blackness that had swooped down on the prairie. How were they to be found? A crestfallen boy, hungry, thirsty, tired, and torn by cactus thorns, at midnight tapped on the window of Eusebio Barrera’s pinewood hut. There was no response. But there was a way to get inside. The window was opened with a pressure and twist simultaneously applied at both ends. A minute later I passed into the sleep of utter exhaustion. Eusebio came just before daybreak. He was delighted. “Great things have happened!” he beamed. Several moments were required to segregate his exultation from my consciousness of calamity. The errant flock of goats was still entangled in the webs of unfinished sleep. Could he possibly find reason for rejoicing in my father’s loss? No; Eusebio wished no harm for anyone except the enemies of the people. “But the goats are gone,” I groaned. And Eusebio Barrera, his right hand aloft, drew himself up to his full five feet and six inches in the stance of a heroic statue. An indulgent providence guarded the scene from cynical eyes. A Don Quixote of the western world stood before his Sancho Panza. There was a pathetic clash between the noble posture and its background. The rough floor boarding was only partly hidden by a tattered fiber matting. Not one luxury graced the raw interior of the one-room shack. The single window was draped with a strip of nondescript oilcloth in lieu of a curtain. The iron bedstead was covered with a brown blanket. There was not even a mirror. Eusebio wasted no savings on elegance. They were needed for the Supreme Cause of Liberation. Eusebio’s moods were as swift as his muscles were flexible. Be­fore his hand had fallen from the gesture of salutation, he was putting into effect a plan of campaign. “Nobody here must know what we do,” he cautioned. It was necessary to conceal our movements lest premature disclosure circumvent the Army of Liberation. “And nip in the bud the career of a war correspondent,” I silently added. It was our duty to safeguard the making of history. This was a military problem. Flawless strategy must be employed. During the night Eusebio had arranged for our separate re­ception at the home of his cousin on San Jacinto Street. There would be awaiting us all the accoutrements of war. We must take along nothing by which we might be traced. Meanwhile, it was imperative that his departure be so orderly and logical as to preclude any speculation concerning his mission. He would settle his accounts with the master, pay all his bills and explain that he was peremptorily summoned to the bedside of a dying kinsman in Bandera County. Our first move must be to quell the alarm and stop the search for the missing boy. That was necessary for the getaway. At the same time, we must obviate any suspicion of a connection be­tween Eusebio’s departure and my disappearance. We must appear to have gone separate ways. All this could be accomplished, we agreed, by assuring my father of his son’s safety. After that we could feel fairly safe from interference at his hands. Wasn’t it only yesterday that he an­nounced: “The boy that makes his bed must lie in it”? Word to my parents should be contained in a note over my signature. Eusebio would place the missive under the front door before the household awoke. Time tugged us into feverish haste. In another hour the whole hacienda would be astir. The search for the missing boy would be resumed. It might come pell-mell to the Barrera cabin. My exit must be effected before there was any danger of discovery. Barrera would follow later in the forenoon. While Eusebio slapped together a meal of tortillas, frijoles and black coffee, I wrote a message to my father. This must be a convincing and satisfying document. It must be a Napoleonic coup to forestall pursuit. Here the talents of a Talleyrand and a Machiavelli must collaborate. The note began with an avowal of regret over the mishap with the wayward goats. A hint followed of contrition over general ineptitude. Then came the clincher—the regretful and chastened son was going away for a period of secluded penitence at the home of a friend, whose name was withheld, for patent reasons. Eusebio was sure the message would accomplish our purposes. I handed it to him—the valedictory of my boyhood. PS -- Thanks to Alex Jay, who sent this MUCH better portrait of Mr. Koenigsberg, found in a 1919 issue of Editor & Publisher. We'll use it for the masthead from here on. Andrew A. Munch was born Andrew A. Montsch in Cleveland, Ohio, on December 28, 1908. Munch’s birth name and birthplace were recorded on his marriage certificate. The birth date is from the Social Security Death Index. In the 1910 U.S. Federal Census, Munch was the youngest of three children born to John, a tailor, and Mary. The Montsch family resided in Cleveland at 220 West 41st Street. Munch’s mother passed away after the census. According to the 1920 census, Munch’s father had remarried to Josephine Ultrich who had two sons from her marriage. Munch was the third of four biological siblings. The family lived at 1328 West 61st Street in Cleveland. It’s not known when Munch changed his surname from Montsch. The 1928 Cleveland city directory listing said “Andrew A Munch” was a clerk and lived at 8301 Detroit. The 1930 census recorded Munch as a newspaper artist rooming at 1289 West 76 Street in Cleveland. 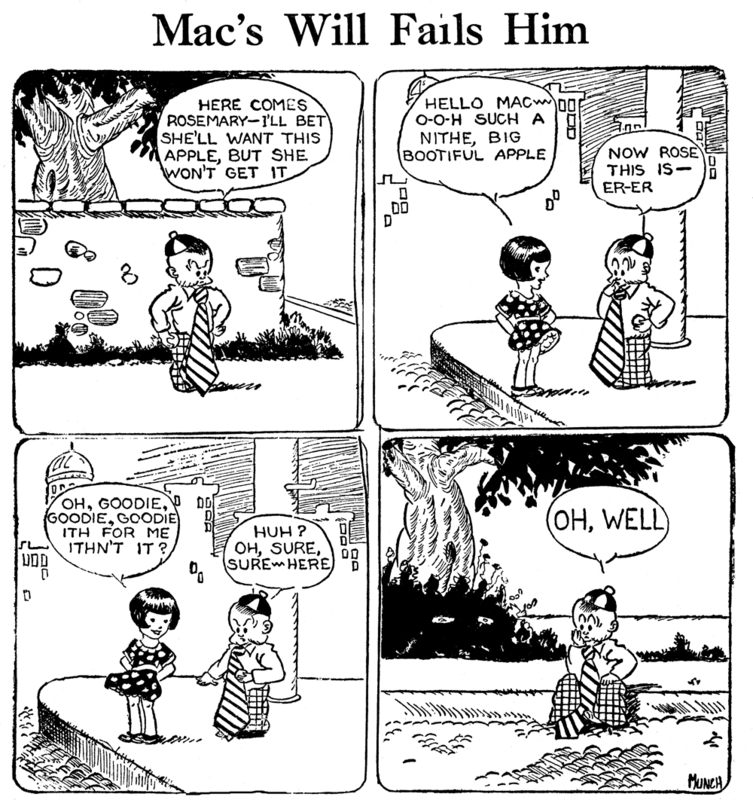 American Newspaper Comics (2012) said Irving S. Knickerbocker created Mac (aka The McCoys) which ran from May 10, 1929 to March 7, 1930. After Knickerbocker’s departure, it was continued by Munch, from March 14, 1930 to November 2, 1936; Howard Boughner and Bob Moyer. The Cleveland Plain Dealer, May 19, 1933, reported the winners of the “Picture-Snatcher” photography contest. There were 29 winners including Munch who received an honorable mention and two tickets to the Jimmy Cagney film, “Picture Snatcher”. At the time he resided at 1920 West 57th Street. The Cuyahoga County, Ohio, Marriage Records and Indexes, at Ancestry.com, said “Andrew A Montsch” married Rose O’Donnell on August 17, 1933, in Cleveland. The 1934 and 1937 Cleveland city directories continued the “Andrew A Munch” listing which included his occupation as NEA Service artist. The couple lived at 8313 Lake Avenue (1934) and 1303 West 87th Street (1937). According to the 1940 census, Munch was a photographer for the NEA. He, his wife and son, Levy, were Cleveland residents at 8100 Lake Avenue. Bay City, Michigan city directories, from 1948 to 1956, listed Munch at 651 Patterson Road. He was publicist for the East Michigan Tourist Association through1952. In 1953, he was an employee of the newspaper, Bay City Times. Munch passed away June 6, 1957, in Bay City. His death was reported two days later in the Plain Dealer. Mac temporarily retitled "The McCoys"
We've discussed several features that were distributed by NEA's weekly 'pony' division. Although they are seldom memorable, they're kind of fun to discuss (for me anyway) because of the musical chairs approach to cartooning them. 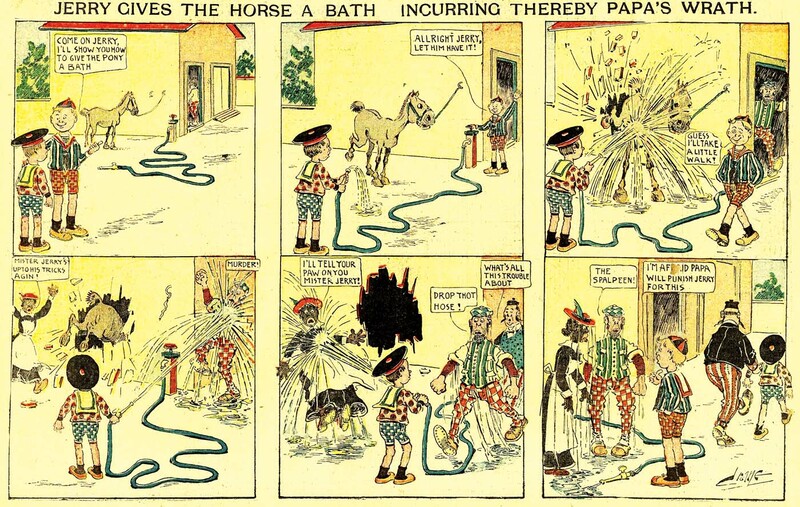 As you can imagine, cartoonists weren't too terribly anxious to take on the thankless task of producing these weekly strips, as the pay was probably low, and so few papers used them that the creators must have felt like they were producing something that just went right down the drain to oblivion. So here we have Mac, which debuted in the NEA pony service on May 10 1929*. 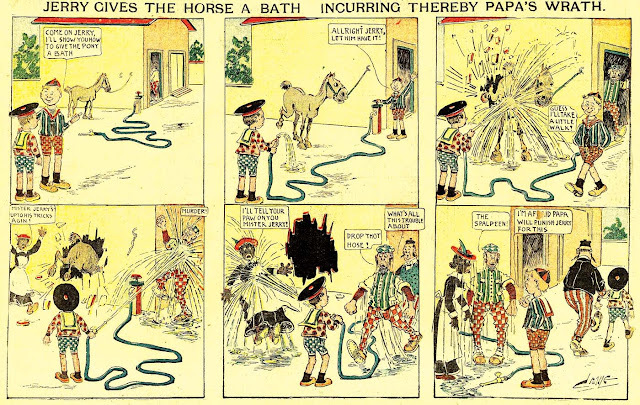 The strip ran in few papers, and is made hard to identify in those that did by using 'headline' style titles (a relic that had gone out of fashion for most strips in the mid-1910s). These headlines often didn't even mention the name of our star. The strip was about a Reg'lar Fellers sort of hyperactive wise-guy kid, sporting a giant tie for a visual trademark. It was originally penned by Irving Knickerbocker who was a mainstay of the NEA bullpen in the 1920s, until his untimely death in 1930. He died in January, but his backlog of strips lasted until March 7. Following Knick was someone who signed himself 'Munch'. He did a fair job of carrying on as his predecessor, and ran the show for over six years, finally bowing out with the release of November 2 1936. Alex Jay has tracked down his identity, which will be the subject of an Ink-Slinger Profile tomorrow. After Munch, the few papers that bothered to take notice were treated to the fluid and dynamic pen of Howard Boughner. It's weird, but I find Boughner's art is best when he probably doesn't care a bit about the assignment, which surely would have been the case with Mac. Other times his art can be a bit fussy, but here that brush just whirls and daubs, leaving the most lovely impressionistic panels. Boughner decided to age Mac a bit, settling him into a new age that seems maybe just short of teen-hood. 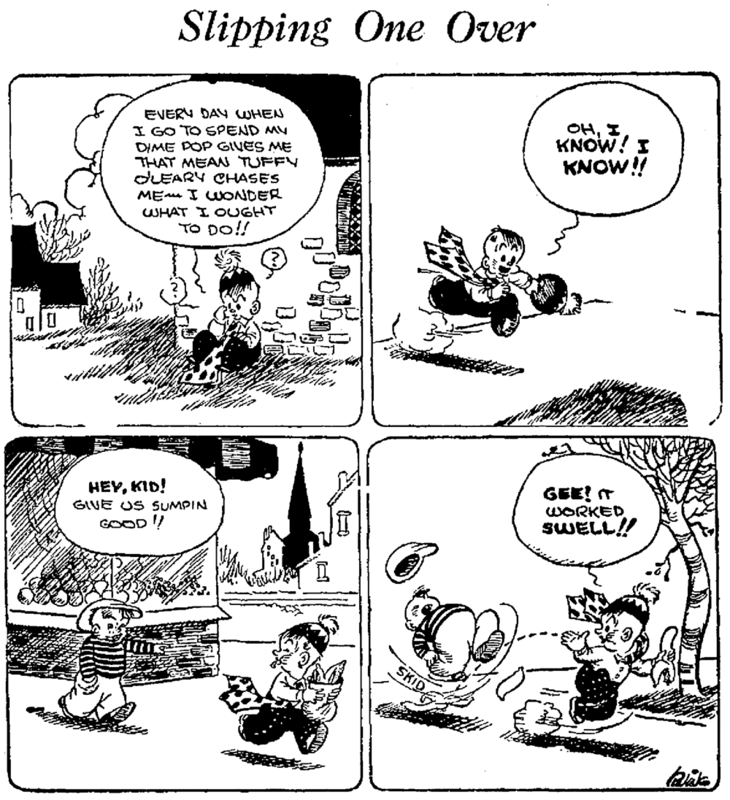 With the number of Reg'lar Fellers wanna-bes taking up residence in newspaper comics of the 1930s, it's nice to see a kid of a different age. For some reason, Boughner changed the name of the strip to The McCoys on March 3 1941. There is no change to the focus of the strip that I can notice. It wasn't long after the name change that Boughner left Mac/The McCoys. On September 29, Bob Moyer took the reins, along with several other NEA pony features. He promptly changed the title back to Mac, starting with the December 1 episode. Moyer really seemed to have a gift for aping other cartoonists. On Ticklers he did a nice George Scarbo impression, and on Mac he did a lovely Boughner-esque job, showing a deft hand with the brush. When Moyer joined the Army in February 1943, the fickle finger of fate pointed back to Howard Boughner. He returned to the strip with the February 8 episode, this time showing his disdain for the assignment by not signing his work. He did, however, keep up the lovely brushwork nevertheless. 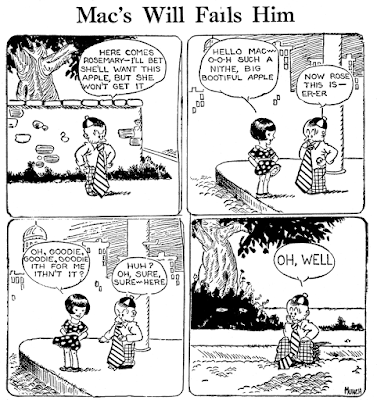 Boughner wasn't willing to let this become a long-term relationship again, though, because the strip was cancelled with the release of May 3 1943. Evidently NEA couldn't find anyone in the bullpen willing to waste their time on a nice little weekly strip that hardly any newspapers seemed to print. * By the way, when we're talking about syndicated strips meant for weekly papers, the specific dates I give are sort of an estimate, because weekly papers publish on different days of the week. Therefore, there is no really official start or end date, but only an approximation -- all the dates given theoretically are plus or minus up to seven days. So when you see dates in these cases, mentally add the words "the week of" and you're closer to the actual truth. In the case of NEA's weekly strips, most of the cited dates come from the actual syndicate archives, which I indexed in their resting spot at Ohio State University. The NEA pony service proof sheets generally said on them "For publication the week of MM/DD/YY" using a Monday date. 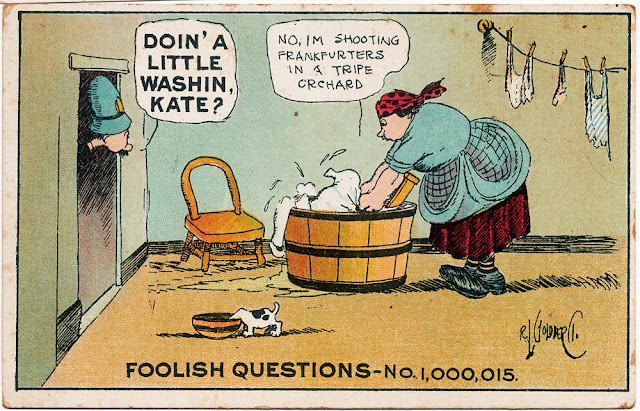 In 1904 cartoonist Frank Crane was producing two well-known and already long-running Sunday comics for the Philadelphia North American, Muggsy and Willie Westinghouse Edison Smith. So what prompted him, I wonder, to produce a series for the nascent and struggling World Color Printing outfit? Whatever the reason, his entry for WCP, Tom and his Little Brother Jerry, was certainly not a strip that figured to be a hit. Crane was one of those endlessly repetitive fellows who would milk the same gag year in and year out, and the gag here -- an older brother delights in getting his little brother in trouble -- wasn't exactly a gangbuster laugh-producer to begin with. But once Crane was set in motion, like one of those plastic birds that drinks from a cup, it was hard to get him to stop. 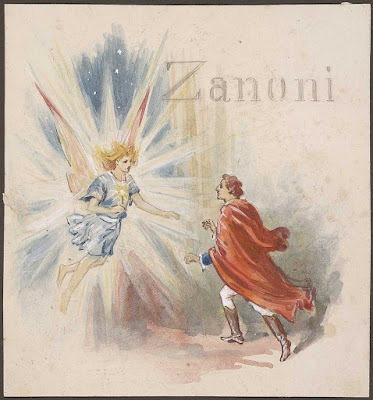 He ended up producing the strip from May 8 to November 6 1904, an absolute eternity by the standards of the early World Color section, which evolved constantly. By the way, for whatever reason Tom seldom got headline billing after the first month or so of the strip, which led me in my book to list "Tom and his Little Brother Jerry" and "Jerry" as two separate strips by mistake. Thanks to Cole Johnson for the strip scan. Oh, and if you're wondering about 'spalpeen'? Dictionary says it is Irish slang for a rascal. Say what you will about his tired old gag, but you have to love his fashion sense! What a spalpeen.